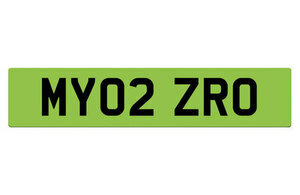 UK To Get Green Number Plates For Low Emission Vehicles? A new government consultation is underway which could see ultra-low emission vehicles being given green coloured number plates as a ‘badge of honour’ for helping the environment. The idea has come from countries such as Norway, Canada and China, where special plates are already assigned to green vehicles such as electric and hydrogen cars. It’s thought that by making the cars more recognisable, ultra-low emission vehicle owners will be able to take advantage of special vehicle lanes, electric charging bays and low-emission zones. “The UK has a proud history of leading the world in technological advances and that is no different for ultra low emission vehicles, where we are at the forefront of innovation and testing,” said Transport Secretary, Chris Grayling. The UK’s thriving electric vehicle market is best demonstrated by the huge growth in sales. Plug-in cars accounted for 3,500 registrations in 2013, five years later that number has risen significantly to 166,000 by the end of August. Elisabeth Costa, director of the Government’s Behavioural Insights Team, said she hoped the move would change attitudes to the situation: “We support efforts to increase awareness of the numbers of clean vehicles on our roads.